This figure, which does not understand and I give a round cucumber is much more important than we may think. 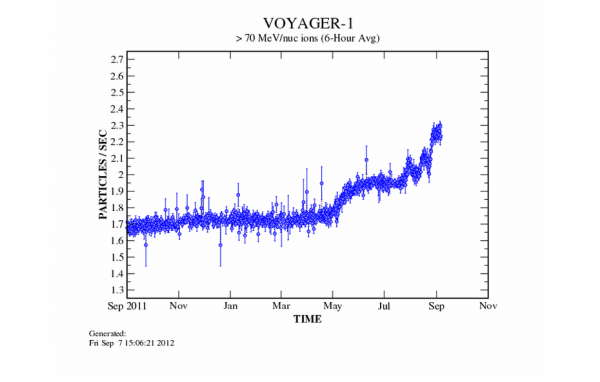 This is the graph of the sensors of the Voyager I wherein the amount of cosmic rays cosmic radiation is detected. In that image is a sudden increase of that amount, which indicates that at that time (May, June 2011) Voyager I left the heliosphere. This means that on those dates, the Voyager I is or there are high chances that were in interstellar space, beyond our solar system. Remember to explain that cosmic rays are the bullets atoms supernova explosions. A magnetic layer (in our case the Earth) and avoids the crossing for us down here, but in the solar system, the sun’s magnetic field prevents many from entering these cosmic “bullets”. Therefore, an increase in the number of such “pellets” detected by the Voyager I can tell you this out of the magnetic field of the Sun and therefore the limits of our solar system. Remember that the heliosphere has no specific limit but varies according to the intensity of these pellets. So it goes from one sphere to an egg and / or is flattened on one side or the other according to give the solar wind. But that, that image, indicating that the Voyager I is the first built by man that has left our solar system spacecraft. A feat since it is the object for the man who has gone furthest created. Not bad for a pileup released in 1977, right?